The Saeks Public Interest Residency Program is a new program established by Allen ’56 and Linda Saeks that connects leading public interest and government organizations with high-achieving 3L students. Students work full-time during their third year of law school for a nonprofit or government agency and have a guaranteed, full-time, paid legal position with the same organization the year following graduation. This innovative model provides students with valuable legal training and a pipeline to employment, while providing the organizations with much-needed legal assistance. Students are selected on a competitive basis by partner organizations during their second year of law school. 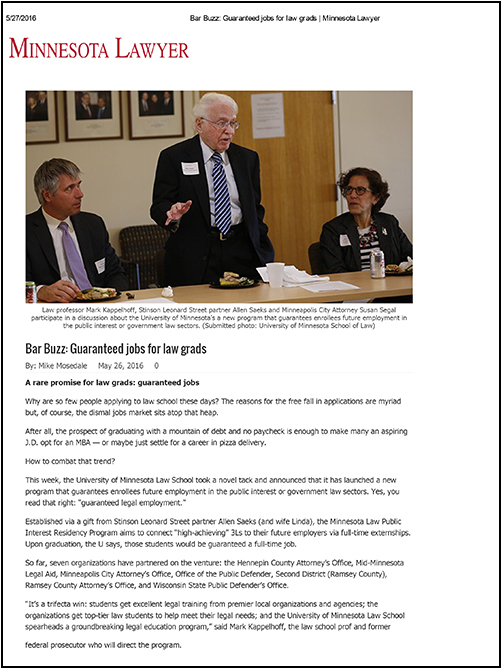 All 2L students at the University of Minnesota Law School who are interested in serving the public while earning their degree may apply. Applications are due in early February. The application is posted on the Law School’s Symplicity website. Leading local public interest and government organizations are the foundation of the Saeks Public Interest Residency Program. The program provides participating partner organizations with a pipeline of high-achieving students with proven dedication to public service. Potential partner organizations benefit from scholar participation for two years—first as an extern and then as a full-time staff attorney—for the cost of a one-year employee. The Saeks Public Interest Residency Program welcomes new partner organizations. To learn more about being a partner organization, contact Amanda Furst. What is the University of Saeks Public Interest Residency Program? Through the Saeks Public Interest Residency Program, students gain nearly two years of significant legal experience in public or government service while earning their J.D. The two-year program begins in a student’s 3L year and continues into the first post-graduate year. During the 3L year, the student will work at a partner organization and participate in a complementary classroom component with other scholars in the program. After graduating and taking the bar exam, the graduate will return to the partner organization as a full-time paid employee for one full year post-graduation. How do I prepare to be selected for the program? Students apply in January of their 2L year. Interested students should discuss the program with their career counselor and verify their graduation requirements, paying special attention to the requirements for in-class coursework and required upper-division classes. Interested students should review selection criteria listed below. How do I apply for the Saeks Public Interest Residency Program? Applications are due in February each year. The application is posted on Symplicity. Students can apply for one or more partner organizations through individual postings. Applicants will provide: (1) resume; (2) cover letter; (3) unofficial transcript; (4) list of references; and (5) writing sample. How many credits will I be able to earn through participation in the program? How can I reach full-time enrollment my 3L year? Students will be able to enroll in additional law school courses as long as the course requirements and times do not conflict with the hours required by the partner organization or the student’s limitation on out-of-class credits. Enrollment in courses while participating in the program requires pre-approval from Amanda Furst, Director of Public Interest Programs. Will participation count toward concentrations offered by the Law School? Participation in the program may count toward the course requirements for certain concentrations. Students seeking to apply the credit hours earned from the program toward a concentration should meet with the appropriate concentration faculty supervisor for approval. How many hours per week do scholars work during their 3L year? Students will work approximately 32 hours a week during their 3L year. These hours do not include the classroom component of the program, which adds an additional two (2) classroom hours per week. Students will arrange their schedules directly with their partner organization. If I am selected for the program, will I have time to study for the bar exam? Yes. Students will end their 3L externship year on the last day of spring classes. They then will have a break until early fall to study for and take the bar exam. What kind of credit and compensation to participants receive? Students will only receive externship credit for the externship year. Students will earn 10 credits per semester, 20 credits per year, upon satisfactory completion of the externship and class components of the program. During the post-graduate fellowship year, graduates will receive a salary plus standard benefits from their partner organization. Who can I contact for more information about the Saeks Public Interest Residency Program?